LONDON, England (CNN) -- A protester who wanted his message to stick managed to superglue himself to the British prime minister Tuesday evening. Dan Glass, right, takes hold of the British PM's right arm just before he was about to receive his award. Dan Glass was at 10 Downing Street to receive a charity's award for his work on transportation issues when he staged the unusual protest. 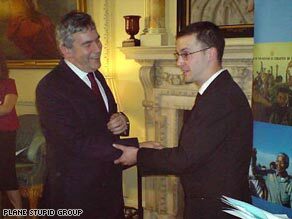 Just before Prime Minister Gordon Brown presented him with the award, Glass squirted superglue in the palm of his left hand. He shook Brown's right hand and then grabbed the prime minister's sleeve. "I've just superglued myself to your arm," Glass said he told Brown. "Don't panic. This is a non-violent protest." "I just wanted a few more minutes of his time to get the message across, because he's not listening to communities affected by airport expansion," Glass told CNN on Wednesday. The prime minister managed to free himself in about 30 seconds, Glass said. "He can shake off my arm, but he cannot shake away climate change," he added. Glass also claimed that some people in the room actually applauded when they realized what has happening. "I think he [Brown] knew he was outnumbered on this issue," Glass said. A Brown spokesman called the incident "minor" and "very lighthearted." Glass said he was allowed to remain at the prime minister's residence for about 40 minutes after the event. "I think Brown would have been humiliated further if an actual award winner had been ejected from the ceremony," he said. According to their website, the Plane Stupid group formed in 2005 inspired by the anti-roads protests in Britain during the mid-1990s. The group -- which describes itself as non-partisan --is funded primarily by donations from individuals and organizations. Members are encouraged to take direct but non-violent action against the aviation industry, a sector they describe as "one of the root causes of climate change."